You want your employees can work together at different locations, using wide range of hardware and software? The progressive automation of processes and the increasing cooperation of departments and organisations in local networks and the Internet causes a growing pressure of innovation and cost in all companies and in all industries. A company that is worsening in his efforts, can quickly lose the connection to the market participants. Denapp plans and implements Web services for you that expose data and functionality via the Internet, for example with OData. Using various techniques, we optimize the load times of your sites and customize the content for better positions in search engines. On request, Denapp also adopts operation, maintenance and backup of your websites. 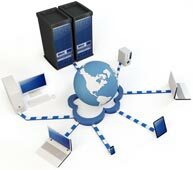 We host your site on our hardware and perform changes for you, while you concentrate on your daily business.